Warpo's new line of Lovecraft-inspired action figures is a direct throwback to the era of blister packs, five points of articulation, and tiny plastic accessories. The creators talked to us about their dream of a Saturday morning animated series about Cthulhu, and showed off some killer concept art. Everything about Warpo has a pitch-perfect retro 80s feel, from the fuzzy VHS commercial for Legends of Cthulhu to using Ken Kelly to create the package art. If you're not familiar with Kelly, you'll recognize his art from KISS' Destroyer album cover, and the cover to Rainbow's Rainbow Rising, not to mention a ton of comic books and classic toy lines. Warpo is also working with sculptor Eddy Mosqueda, who was senior sculptor at Mattel in the mid-80s, designing some of our favorite Teenage Mutant Ninja Turtles and Masters of the Universe figures. They've basically assembled an action figure dream team. Company heads Bryan Katzel, Tommy Baldwin, and Eric Lefeber, along with Eddy Mosqueda, spilled all the details about Warpo's Legends of Cthulhu and their future plans. io9: What was the inspiration for creating Warpo? Bryan Katzel: We were on a family vacation at Disney World, the happiest place on earth... and I was miserable. A lot of things were happening in my life that made me question why I wasn't making more of an effort, taking bigger chances to follow my dreams. So the next morning when our families met up to explore the Animal Kingdom I told Tommy, "We're going to start a toy company" - and that's what we did. When we got home we reached out to Eric and within 24 hours he was on board. Our team are lifelong collectors and we scour conventions, flea markets, thrift stores and beyond to find the next cool thing to collect, nostalgic or not. A year back I really started noticing more and more customizers / bootleggers that were essentially doing "mash-ups" of different action figure parts to create new characters, new stories to the toy lines they love. It struck me that, with the rise of eBay and the internet, collections were being completed quicker than ever and collectors still wanted more. These guys had all the Masters of the Universe figures they could get but were continuing the story, making new toys that sat right along side their current collections. That made me think, why not just make new brands and figure lines that look identical to their retro counterparts in every way? io9: Could you tell me about the process of sculpting a figure that's going to have articulation, versus sculpting a static figure? Eddy Mosqueda: I always try to make the design aesthetic the priority in each new project. The articulation is worked into the design with the idea that it will compliment the form and not dictate it. With the Legends of Cthulhu I really enjoyed bringing forth so much character in the form and faces that it was easily adapted to the classic 5 points of articulation. I reveled in the challenge of working within these parameters and I feel like they turned out to be some of my most crazy, unique , and memorable figures. io9: How does Warpo take something from concept to completion? What's the process? Bryan Katzel: Warpo's process for product development is mostly dictated by a concept we've coined as "method manufacturing". Much like method acting, method manufacturing is a process in which we apply a group of techniques to help us think, design and create in ways very similar to a predetermined time period. After we get an idea for a direction to head, the first step is research to confirm we have a firm understanding of an Era and the Collecting Platform that originated from that time. This goes beyond just knowing all the names of your favorite product lines during that era. We take into consideration the reasoning that manufacturers would have made certain aesthetic decisions, limitations in technology and trends in popular culture to name a just a small few. After that we apply our learnings to create a new brand / toy line that has never been seen before but feels instinctively familiar to collectors. We're not looking to dust off old licenses or create toys that collectors already have figures of - Warpo is looking to tell new stories in old ways. Then comes the design stage where our team focuses on creating an experience through product & package design authentic to the period by working with industry veterans that bring insight long forgotten to the toy industry. For example, with Legends of Cthulhu we worked with Eddy Mosqueda who was with Mattel and making figures during the time periods we're looking to duplicate. He brought insight to the project and styling that really helps to make it all feel believable. And it was a no brainer working with Ken Kelly. From Micronauts to LJN's Advanced Dungeons and Dragons line, Ken was painting some of our favorite toy packaging during the 70's & 80's. Just the fact that he painted the Legends of Cthulhu packaging artwork on the same easel as he painted the KISS Love Gun album cover makes the whole thing feel like it's traveled through time to get here. And the final stage is production. This is where Warpo finishes it all up properly by working closely with manufacturers & vendors to use materials and deco appropriate to the designated time period and to try our best to produce a final product that feels like something that time forgot. io9: Your first set is Legends of Cthulhu - which figures will we be seeing? Any chance of a R'lyeh playset? 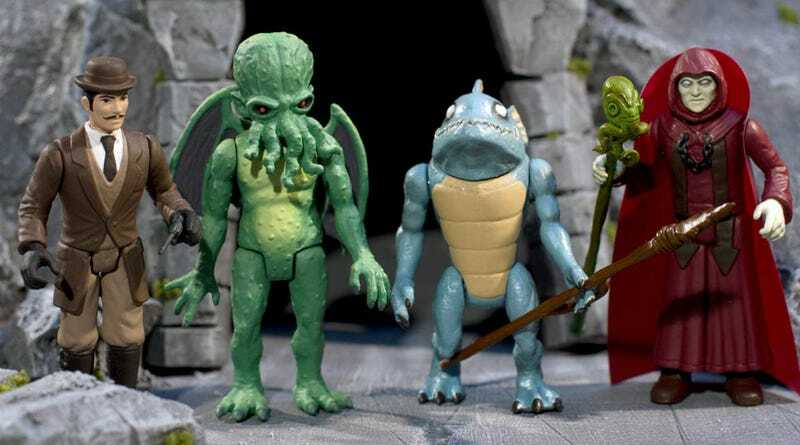 Bryan Katzel: The initial figures in the line-up are The Cultist, The Deep One, The Professor, and Spawn of Cthulhu. As far as going beyond that, keep your eye on our stretch goals...you might be surprised. We'd love to see how far we can take this, playsets are expensive to produce but not out of the question if the demand is there. At the same time there are other toy concepts that are currently in the product development pipeline that we're excited to get working on. Our team really wants to explore the platform of "method manufacturing" to the fullest which means going beyond action figures when we see the opportunity. io9: 80s toy lines were always closely tied to animated series. Pitch me an 80-style cartoon based on Legends of Cthulhu. Bryan Katzel: Yes! Now that's what we're talking about. We've tried to imagine this action figure line being part of cartoon series from the beginning. Definitely done by Filmation and definitely a little bit "off" or commercialized if you know what I mean.So let's have a go at it..."Legends of Cthulhu is an animated action / adventure series following the Professor, his nephew (it was never "his son"... always a nephew) and his steam powered mechanical monkey as they travel across the globe investigating the mysterious "Legend of Cthulhu". They travel across desert, jungle, ocean and ice hunting down the rare mystical idols — all the while with the Cult of Cthulhu (enter, The Cultist) close on their heels, slowing our adventurers down just enough that when they finally reach their destination they only get a brief glimpse of the Old One, as he disappears into the mist. And the only thing Cthulhu ever leaves behind is confusion and next week's adventure...on the LEGENDS OF CTHULHU!!!!" io9: What are Warpo's future plans? More from the Cthulhu mythos, licensed characters, your own designs? (I'd like to cast a vote for a Robert E. Howard series). Bryan Katzel: Warpo's philosphy is to only make toy lines that have never existed before and we've got some amazing original properties that we can't wait to put in the time machine and bring to market. Exploring the Cthulhu mythos further is not out of the question but there is so little time and so much Warpo wants to do... like Solomon Kane and Conan! io9: What can you tell me about your plans for distribution and print runs? Any plans for alternate paint variants or things like that? Bryan Katzel: After the Kickstarter exclusive production run we'll launch our standard retail version of the product line. We don't have much planned for variants but definitely stay tuned to the Kickstarter because you never know what might show up! Our plan after the Kickstarter is to solidify a few key e-tailers to launch the product line with and also make LoC available through our own Warpo online store. You're exactly right that this has to stay completely flexible as you never know what can happen when you're crowd funding a toy with the cosmic power of the Great Old Ones.